The Active Duty Option is one of the three ways that you can go Green to Gold. It is a program for enlisted Soldiers who wish to complete their first baccalaureate or advanced degree, and pursue a commission as an Army Officer through ROTC. The distinguishing feature of the Active Duty Option is that you do not have to separate from Active Duty while you are in ROTC. You retain all of your pay, leave, and military benefits with this option. The Active Duty Option is a two-year program. Meaning that you must be able to complete your degree within 21 months (two academic years). Before you are eligible for this option, you should have at least 60 credits towards your undergraduate degree, or be capable of finishing graduate school within 21 months. 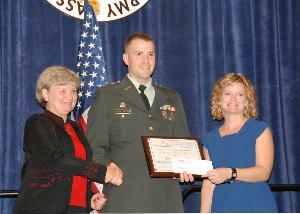 Earn a baccalaureate or advanced degree, and receive a commission as an Army Officer. Maintain pay and allowances at your current grade (also special duty pay i.e FLPP, career counselor pay, etc.). Maintain other military benefits, like access to Army programs, PCS/Transportation benefits, Tricare, and SGLI (tuition assistance benefits are excluded for ADO). If qualified, access to Montgomery G.I. Bill/Army College Fund (MGIB/ACF) benefits, or Post 9/11 G.I. Bill benefits. The selection board for ADO is historically very competitive, and takes place only during the April Selection board [more about board deadlines]. In order to be ready for the ADO board in April, you should begin completing the most important first steps of your application early. Have not reached age 34 prior to 1 August of the year which the degree and commissioning requirements are met. (Age waivers will be considered for applicants with quality qualifications). Have completed at least two years of active federal service, but less than ten years of active federal service (AFS) at the time of commission (waiverable). Have at least 48 months time in service remaining upon entering the program (you don’t need this to apply, but you must extend/re-enlist if you are selected in order to be eligible). Minimum 2.5 GPA on all previous college work completed. Must have passed an Army Physical Fitness Test within last six months. Must have favorable recommendations from Chain of Command (immediate and field grade). Must have unconditional acceptance at an academic institution with academic status as a “junior” or “graduate” student. Must be able to complete undergraduate or graduate classwork within 21 months (as indicated on CC Form 104-R). Must obtain a letter of acceptance from the Professor of Military Science (PMS) providing acceptance into the Army ROTC program. Have a favorable or have initiated a National Agency Check Local and Credit (NACLC). Is medically qualified for participation in the ROTC program as determined by DODMERB, the agency responsible for reviewing physicals (Must be medically qualified by 15 July). No more than three dependents. Not a single parent with custody. Not married to another service member with one or more dependents (waiverable). Remember to apply to school and get your DODMERB physical as early as possible. Getting these steps done early will give you the time you need to make yourself more competitive before the April board. If you would like to take advantage of the opportunity to pursue and ADO Green to Gold packet, and you are qualified, contact us and let us know that you are interested. We are more than willing to help enlisted Soldiers pursue this option and begin an application packet. You can also set up an account at ArmyROTC.com to begin your ADO packet. This entry was posted in Information and tagged Active Duty Option, ADO, Deadlines, DODMERB, G2G, Green to Gold, ROTC. Bookmark the permalink.